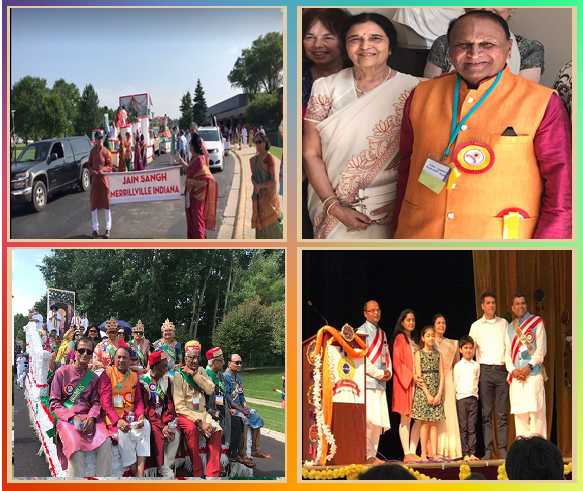 Recently, I attended 25th Anniversary celebration of Jain Society of Metropolitan Chicago and I am glad to be a part of special events like float procession and the bust statue inauguration of Gurudev Shri Chitrabhanuji. Stay connected for more updates from the celebration. International School for Jain Studies completed their first batch of 2018 summer program in Delhi, and more 3 batches are expected to arrive in first week of July. The Program has participants from around the world. More details are given below. YJA Convention is already started and youth are full of energy for all the events. Stay tuned for all the updates. The Indian Government has canceled the proposed export of sheep and goats to UAE after a heavy protest from the Jain Community. This victory is for now and not the final outcome. To avoid it in future, we must continue to stand up against this cruelty towards animals. Details are given below. Q 1: Do Arihants accumulate karmas? Q 2: How many attributes do Arihants have? 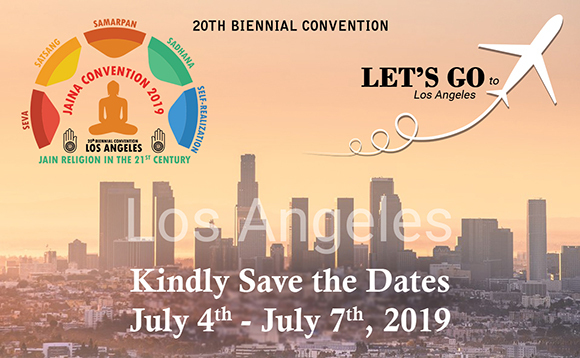 JAINA EC, JAINA Convention Board and Jain Center of Southern California are excited to invite you to a 4-day JAINA Convention from July 4 - 7, 2019 in Los Angeles. Registration opens in August. It's a wonderful opportunity to explore 'Jain Religion in 21st Century' in Southern California. Click here to more details about JAINA convention 2019.
International School for Jain Studies (ISJS) Summer Program 2018 began on June 12 with 17 scholars from the USA, Ukraine, Ethiopia, Sri Lanka and India. The Indian scholars came from Shrimad Rajchandra Mission, Dharampur. As part of the curriculum, scholars were given lessons on Antiquity of Jainism, Metaphysics, Karma doctrine, Epistemology and Jain way of life. The other three batches of scholars to study Jain Yoga, Indian Dharmik traditions and Peace are expected to arrive on July 1, July 4 and July 8 respectively. In all, 63 participants from these countries including Australia, Zimbabwe, and Canada will be attending the programs. Long ago in the city of Srichandra, King Tarapida had a minister named Sumitra. He was a devoted shravak, and he regularly practiced samayik, pratikraman, and other religious rites. One day, the king ask Sumitra why he had overloaded himself with all these worthless activities. He wanted to know what he achieved out of them, and suggested that he should give up these things so he may have a pleasant life. 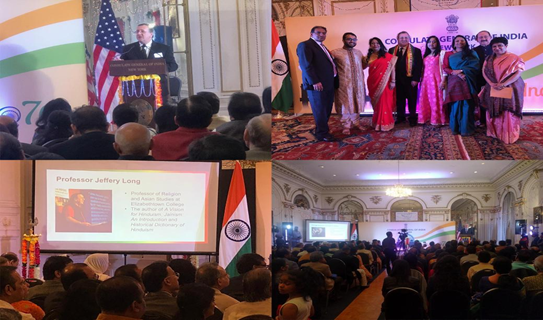 On May 6th, 2018 YJP had the opportunity to attend a Mahavir Jayanti event at the Indian Consulate in NYC. This was the first time this event was being held in New York City, where YJP co-chair Sagar Khona was able to attend the event and introduce YJP to many influential delegates. The event was a phenomenal opportunity for YJP to grow with the community. They had a guest speaker, Dr. Long, who is an expert in Jainism and has written the number one selling book on Jainism. Along with Dr. Long there were many New York State district representatives. 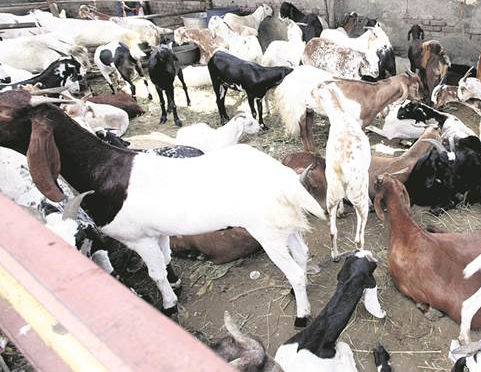 The Indian Government has canceled the maiden export of sheep and goats to Sharjah in the UAE, which was to begin from Nagpur, following protests by members of the Jain community. The export project was initiated by the Ministry of Commerce and Industry in order to increase employment facility and bring an additional source of income to the farmers. Initially, it was decided that 2,000 sheep and goats will be exported to UAE from Dr. Babasaheb Ambedkar International Airport. The program, which was to be expanded to about one lakh animals on some 40 flights scheduled over the next three months. However, members of Sakal Jain Samaj, led by Richa Jain, marched to the RSS headquarters in order to protest against the initiative. Ms. Jain said there are several other options to increase the income of farmers rather than sending sheep and goats to slaughterhouses. Once it starts, it will not remain restricted to Nagpur alone but will spread to other parts of the country. The export proposal was canceled and postponed for an indefinite period after the Ministry decided to first hold talks with the Jain community. While this is a victory decision, for now, it is not the final outcome. The Jain community and all animal lovers will have to continue to exert pressure, be vigilant and be diplomatic but firm in handling the high profile livestock export issue. A 1: Yes, Arihants accumulate the karmas, but those karmas do not stay for more than a fraction of a second. A 2: Arihants have twelve attributes.